Unlike in previous years, which have seen the creation of highly involved decorative and festive window installations including the likes of ‘A Ski Chalet’ and ‘A Paper Winter Tale’; this year The Mill’s London studio decided to do things a little differently. The funds usually spent on decorating the studio will be given to the homeless charity Depaul. With the end line, ‘Homelessness has no place’, their amazing work helps to provide both emergency accommodation and longer-term housing to help provide immediate and effective solutions for young people in crisis. The homeless make up some of the most vulnerable and socially excluded people in our society, with over 80,000 people in the UK recorded as sleeping rough on the streets during 2015/16. This figure has more than doubled over the last five years, and tripled over the last ten years. In spite of the figures, government funding to services that help individuals avoid homelessness has been cut by 45% in the last six years, with the same amount of young people sleeping rough doubling in the same period. 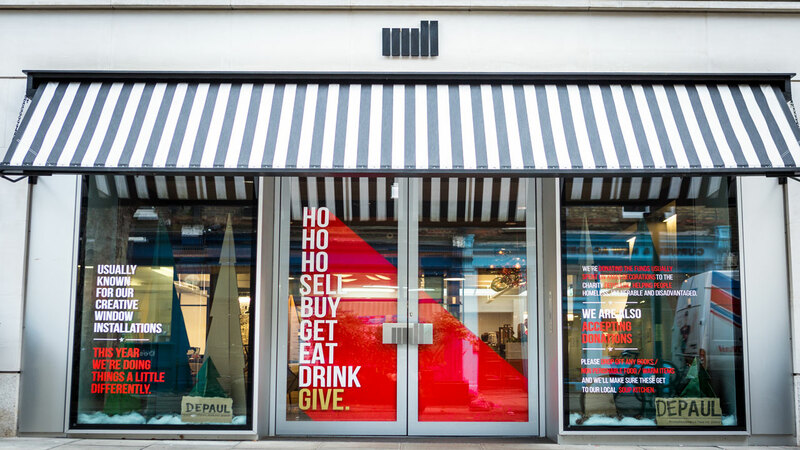 With this in mind, and mirroring Depaul’s cardboard logo, The Mill’s interior Christmas decoration has been totally stripped back, featuring a cardboard forest of Christmas trees so as to ensure every penny reaches the charity. The front entrance vinyl design is also a typographic call to action to further explain the approach. The Mill discovered Depaul after working on their recent campaign, ‘Jordan’, with Mill Colourist Oisin O’Driscoll grading the moving film, directed by Prakash Nathan. It depicts the story of Jordan, a young victim of homelessness and is shot across various locations where he grew up. Jordan’s story, like many of the stories of those who find themselves on the streets, shows how easily young people can quickly end up displaced and in crisis. The message of giving also continues throughout the month of December, through The Mill Collection. With the support of other local businesses, The Mill will be encouraging both staff and visitors alike to donate books, non perishable food and warm items which will be sent to the local Soup Kitchen on Tottenham Court Road. A key opportunity for people to donate will be at The Mill’s annual Xmas Fair, which will take place all today throughout the London studio. There will be twenty-five stalls spread across all five floors; from jewellery makers and candle sellers to artisan chocolatiers and free workshops including a DIY biscuit decorating bar. Please join The Mill in aiding Depaul by attending the Xmas Fair and bringing along a donation, we look forward to seeing as many of you there as possible for the usual festive fun with a meaningful twist!